In honour of Australia Day I thought I'd show you one of my favourite Aussie polishes (I wore a few weeks back). I have too many Aussie polishes I love that I can't pick just one favourite but this one is up the top of the list. We have some really great local polish brands. 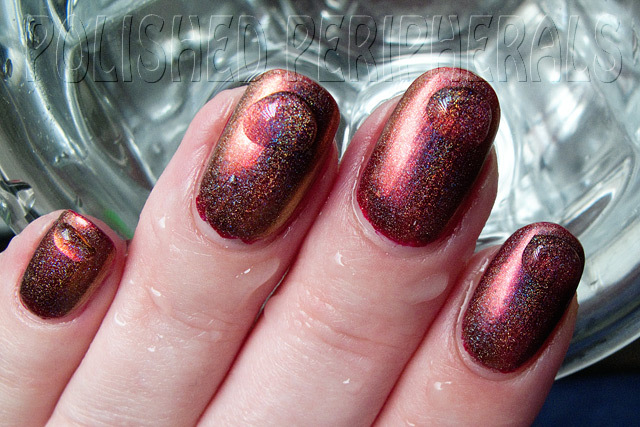 So this is Ozotic 531 (photo spam), one of the mish mash polishes. It's a holographic multi chrome! 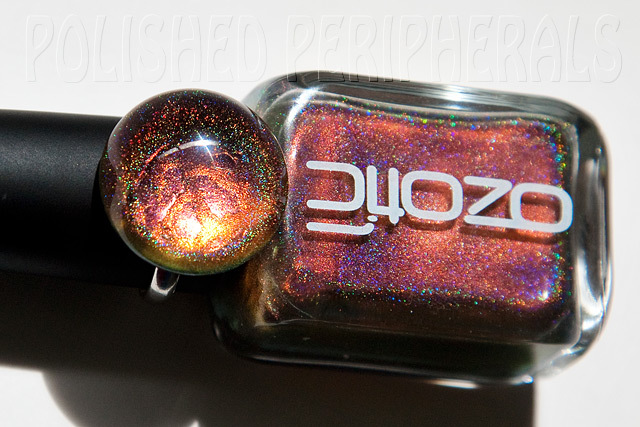 It looks like it's a holo version of Ozotic 502 or 520 but as I don't own either of them I can't tell you which (they're both on my wish list). 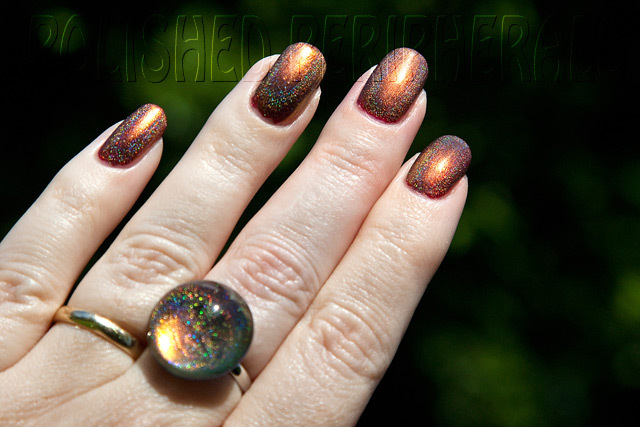 The colour shift is mesmerizing and the holo is like rainbows on my fingertips. It's one of those polishes that is a hazard to driving because I can't stop staring when the sun hits my steering wheel. Even my husband is fascinated with this polish. Photographing the colour shift and the rainbows is hard but here goes. 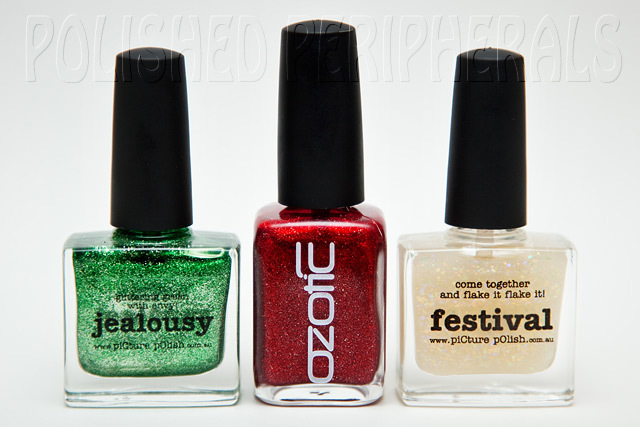 The Ozotic multi chromes show best over black but for this polish I wore red underwear. Face of Australia Molten Metallics Flaming Lava. I didn't get any photos of Flaming Lava on it's own but it's a very nice metallic red that's opaque in one coat. It would probably work well for stamping and it was the perfect complimentary underwear for Ozotic 531. I didn't like how it showed around the edges, looks a little bloody for me but that's just my sloppy paint job, I didn't cover it well enough with the Ozotic. I used 2 coats of Ozotic 531 and I liked the results so much I made myself a ring to match then walked around in the sun checking out all the different colours flashing on my hands. I think I like this coppery shift best. The ring has a black base/back rather than red but other than the edges I can't see any difference. Now here's a little bit of magic. This is what I see when I do the washing up (photographed in clean water though because it looks much nicer). 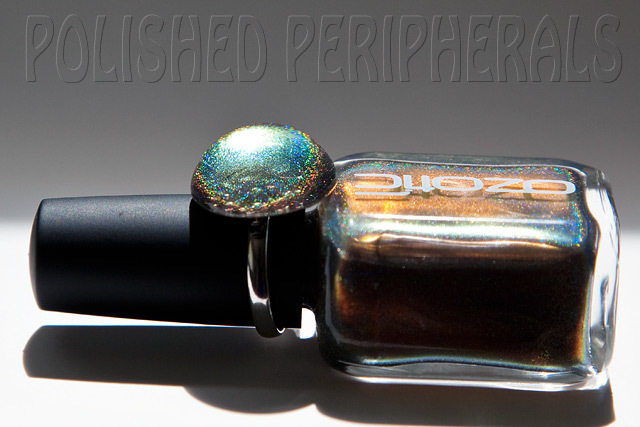 Have you tried your Ozotic multi chromes under water? The water brings out some really beautiful colour shifts. It's the perfect excuse to enjoy a long leisurely soak in the tub. Me, I just get to wash up. Yep that's some shocking regrowth. These water photos were taken after 7 days of wear. I wore this polish for a week with Poshe top coat, no chipping, no cracking, no tip wear and no peeling. I hate having to a remove a polish before it chips bit I couldn't handle the regrowth after a week so off it came. I bought my Ozotic 531 mish mash from piCture pOlish http://www.picturepolish.com.au I've also bought more than a few piCture pOlish polishes from them and the customer service is great (the polishes are pretty great too, and addictive). They ship internationally. 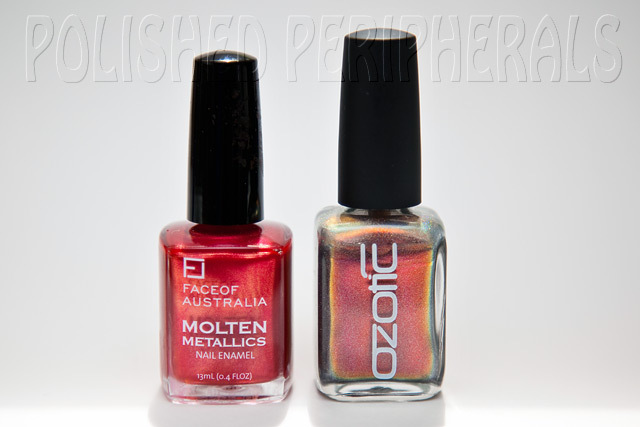 Face of Australia http://faceofaustralia.com.au/ polishes are available from Priceline, BigW, Kmart and online from Fashion Addict http://www.fashionaddict.com.au Yep they ship internationally too. I love Flakies so when I found a new Australis flakie top coat at my local Priceline I snapped it up even though it looked the same as others in my collection. You can never have too many flakies right? 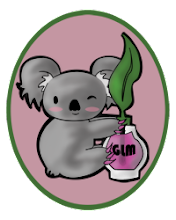 I'm excited about Australian brands coming out with flakies. I have one from Picture Polish but all my others are from overseas brands and there's many out there that may never reach Australia. 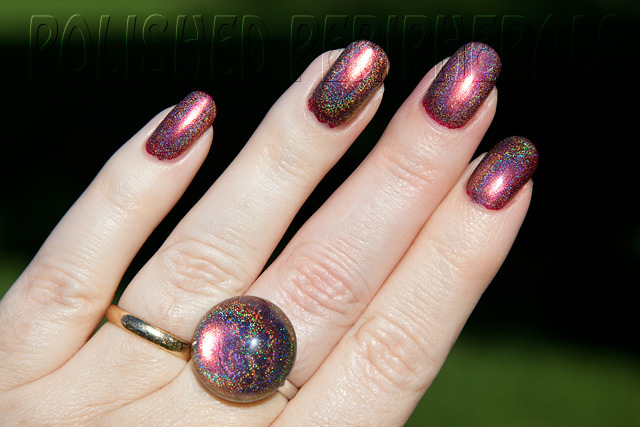 This is Australis Speck-tacular Crystal Colour Top Coat. As you can see it looks just like Picture Polish Festive, on the inside. So I swatched them both over black on a nail wheel for comparison. This is two coats of each flakie over Ulta3 Black Satin. Australis on the left. They look the same and application and drying time seems the same. They have the same coloured base and same size and density of flakes. It looks like there's more turquoise flakes in the Australis but I'm pretty sure that's just random flake placement. If I hadn't labelled them I wouldn't know which was which. Still I'm glad I have both. While I was swatching flakie comparisons I decided to do Essie Shine of the Times, Nubar 2010 and Nfu-Oh 44. 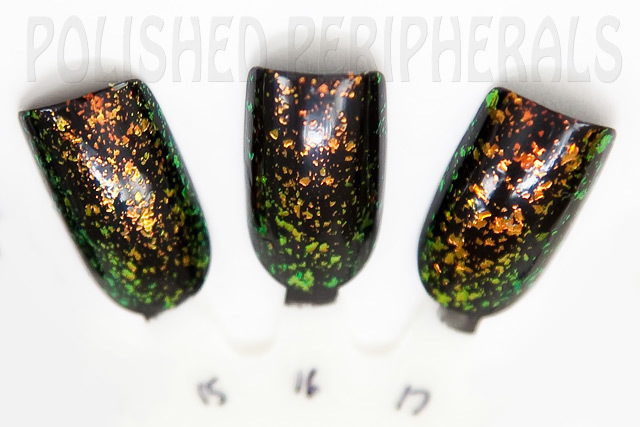 Left to right this is Essie Shine of the Times, Nubar 2010 and Nfu-Oh 44, each are one coat over Ulta3 Black Satin. These are very similar but I can pick the differences. Essie has a denser concentration of flakes and the Nfu-Oh has larger flakes. All have orange flakes that flash green and gold. The colours look the same over black but the Nfu-Oh flakes are suspended in an orange jelly so over a coloured base it would be quite different to the Essie and Nubar flakies but I included it here because the flakes look the same. One of these days I might get around to comparing my blue and green flakies but for now I just wanted to try out the new Australis and compare the oranges. When you're waiting for a delivery of nail polish one way to make it arrive is to paint your nails. Without fail nail mail will always arrive when you've just spent a fair bit of time perfecting a manicure, and before it's dry. Leaving you with the difficulty of signing for and unpacking precious little bottles without smudging your wet polish (or you could wait but who does that) and the dilemma of leaving your new manicure to dry or removing it all just to try your new pretties. Yep I always seem to have wet nails when the delivery guy comes and if I don't do my nails he doesn't stop here. Yesterday I waited to be sure there were no deliveries and then I sat down to do a many layered manicure I'd been planning in my head for days. Just as I got to layer seven (I did 9 in total) the postie came and I found myself staring at two well wrapped parcels on my kitchen bench and ten wet nails. So what did I do? I opened them of course, very carefully with a pair kitchen scissors (I sniffed the packets first to avoid any nasty surprises, broken bottles smell and it's better to know they're broken before sticking your hand in the bag/box, I speak from experience). It was a good mail, (all nail mail is unless it's broken) I unwrapped each bottle while gasping 'oh wow, oh wow'. Then I tenderly clutched my new preciouses to my chest and rushed outside to see them in the sun, the sun that chose that very moment to show itself for the first time all day. I'd been in and out watching clouds all morning, armed with my camera. 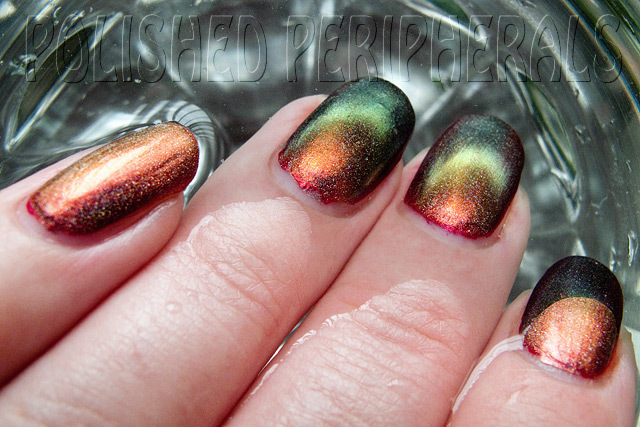 I call it chasing rainbows because I was waiting for some sun to photograph holos. 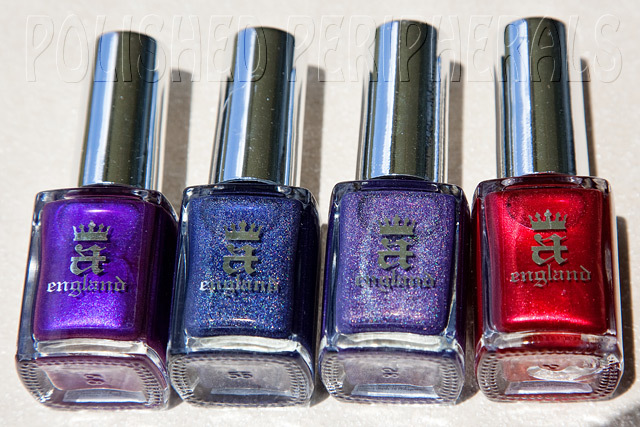 Here's the new goodies all lined up in the sun :) A couple of OPI's and some a-england Mythicals. Of course I couldn't let that sun opportunity pass without snapping a shot of my (nearly dry) manicure, still chasing rainbows. I'll save the details of this silvery concoction for a later blog post. Yes my hand is a bit puffy, it's a side effect of humidity, age, lack of sleep and blood pressure (or maybe it's just fat). These lovelies are my first a-england polishes. I'm not sure whether it's the names, the origin (I'm from England originally) or just the stunning colours but I'd been lusting after these for ages. Price and conversion rates kept me from buying but I couldn't resist the 1st anniversary sale. I had a hard time keeping it to just four of the collection, and deciding which ones I needed most, but I think I made the right choices with Avalon, Lady of the Lake, Tristam and Perceval. Avalon is a gorgeous royal purple that just glows, Tristam is a rich blue with fine smooth holographic shimmer, Lady of the Lake is very similar to Tristam but purple, and Perceval... oh Perceval, I think I'm a little bit in love with Perceval. The most amazing, glowing, red. It has a lit-from-within look that I can't take my eyes off. Swoon! My other new goodies are these dazzling OPIs I won from Chels at Pretty and Polished blog http://prettynpolish.blogspot.com. I don't have many OPIs, they are just so expensive here. When I gave up nail polish about eight years ago I gave away most of my collection of polishes. One of the few I kept was my first ever OPI and now I'm back on the polish and that first OPI is still as gorgeous as ever (except the newer brushes are much better). So I was really excited to win these in Chels' giveaway. 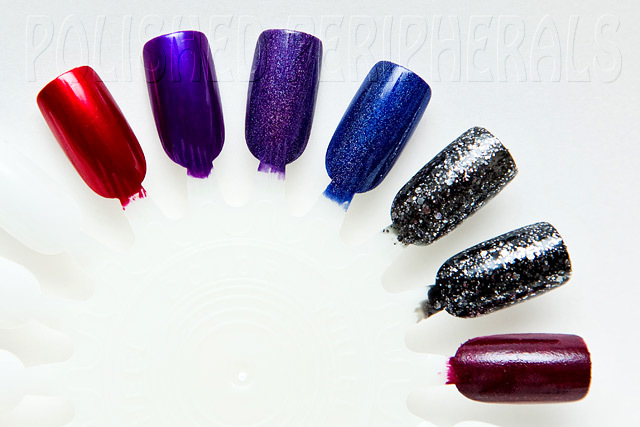 This is Metallic 4 Life from the Nicki Minaj collection and Pepe's Purple Passion from the Muppets Collection. Thanks Chels! I'm looking forward to wearing these. 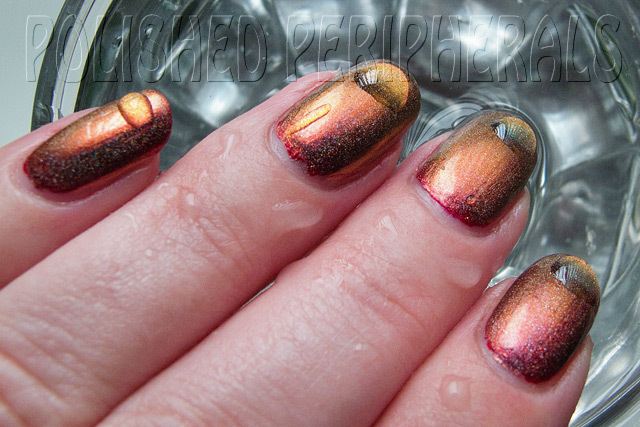 Actually Metallic 4 Life would have been perfect for about layer 3 of the manicure I was working on when it arrived. Did I remove my many layered manicure so I could play with my new beauties? Nah I try to only do my nails once a week and have a two day rule. I paint them and have to leave them for two days before I let myself play with any extra layers, stamping, nail art etc and then on the last day, before I remove the polish, I experiment with things I'm likely to want to take off straight away like a my frankened holo crackle (it worked well but I didn't make enough for a full manicure). So out came the nail wheels and I had fun testing all my new polish. Here we have two coats of each of the Mythicals. They are pretty much single coaters but I like to do two. Then two coats of Metallic 4 Life, then one of it over Ulta3 Black Satin and three coats of Pepe's Purple Passion. Pepe's Purple Passion was harder to get even and has a strange bumpy finish which I wasn't expecting. It would probably be better with a nice thick top coat and may apply easier over a base coat. Sometimes it's hard to judge these things on a nail wheel. Metallic 4 Life of course had a glittered texture but less than I expected and the Mythicals are smoooooth. I am really looking forward to wearing all of these but if I stick to my one manicure a week rule it will take me six weeks to try all these. I might have to have some mid week manis. The Mythicals collection is available from the a-england website at www.a-england.co.uk and I have to say the customer service rocks! Adina is a sweetheart and an inspiration. She has the most handsome cat and I love her 'united world' policy of free international shipping. Chels from Pretty and Polished blog - http://prettynpolish.blogspot.com has an Etsy store - http://www.etsy.com/shop/PrettyandPolished selling her own range of polishes. I must admit I have more than a few on my wishlist including Martian Salad, my favourite shade of green. I'm not sure whether I chose this combination of polish for the name or the look. There's something quite nice about saying it's hard to resist a blue eyed girl and it's a look that's hard to resist too. 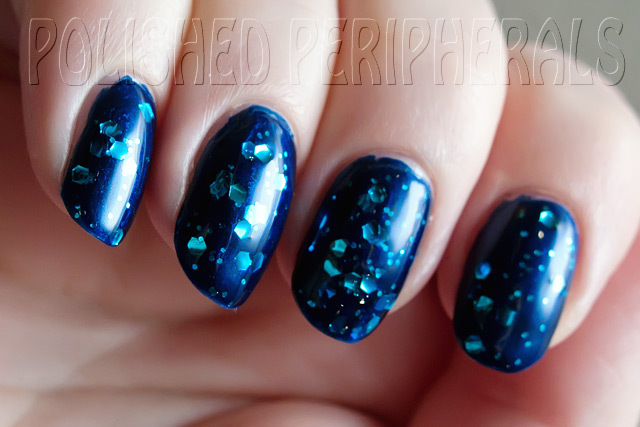 A lovely blue that's almost black in low light with brilliant chunks of glitter that seem to glow even more in low light. 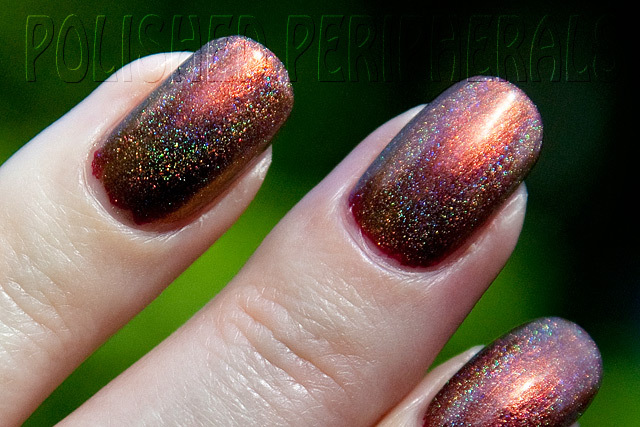 I find myself lying in bed at night waving my hands in the air to watch the glimmers of light on my nails. This is Essence Hard to Resist, a beautiful shimmery midnight blue with a touch of turquoise, just a touch. It's wonderfully pigmented and easy to apply. This is two coats but I could have got away with just one (I'm a habitual two coater). I'm so happy we can get these Essence polishes in Australia now. The bottles are small but oh so affordable and I love the square brushes. I only have six Essence polishes but I'm really pleased with them all. The formula is great. The only problem is they seem to be too popular, they sell out too quickly! I'm sure I'm driving my husband crazy with my need to check the shelves for new stock every time we go to the shops. Over Essence Hard to Resist I layered a thick coat of Kleancolor Blue-eyed Girl, a blue jelly with a mix of large and small hex glitter. At least I think the small glitter is hex too, I had a close look with my glasses on but still can't be sure. Blue-eyed Girl is a thick goopy polish, but it needs to be to hold up that glitter. 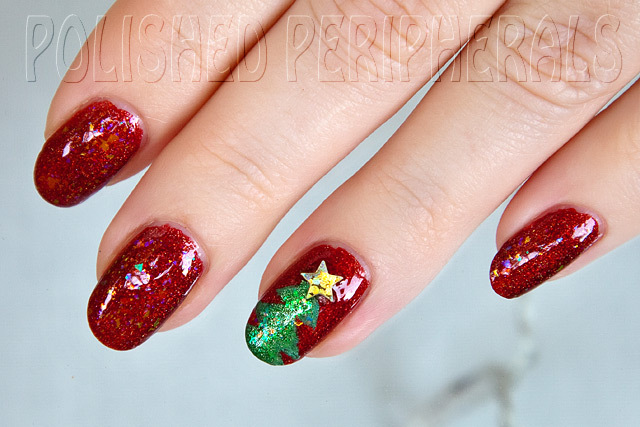 The goopiness (is that a word) made it easy to spread on a nice thick layer with plenty of glitter coverage. There were only a couple of pieces of glitter that didn't sit flat so I pressed them into place with an orange stick. Like the other Kleancolors I've tried this one stinks and takes ages to dry. I ended up using Essence Express Dry Drops followed by Essie Good to Go top coat to dry it. I used a second coat of Good to Go to make a nice smooth finish over a few stubborn bits of glitter that wanted to stick up. Sorry about the messy edges but I don't paint as well with my left hand. I photographed my right hand though because I have a different base polish on my left. Both with Kleancolor Blue-eyed Girl but different blue underwear. What I'm wearing on my left hand and why it's different is a long story so I'll save it for another post but this polish combination on my right hand has worn well. I'm now up to day six without any chips or tip wear. Interestingly though I now have bad shrinkage showing with cracks down the sides and across the base of the nail polish but only on my right hand. It started showing yesterday and has visibly progressed today. My left hand has no shrinkage at all so something to do with the combination of Essence Hard to Resist, Kleancolor Blue-eyed Girl and Essie Good to Go is still at work shrinking away from the edges but the Kleancolor and Essie have no such problem on my left hand over a different blue. I'll be taking this lot off tomorrow. Not looking forward to removing this glitter. 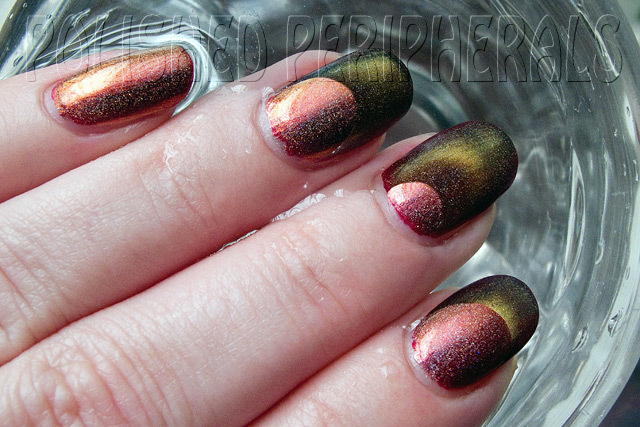 I use the foil method to soak off glitter polish, and lightly file the surface of the top coat first to help with the soaking process, but I expect the thickness of this layering will be hard to remove. 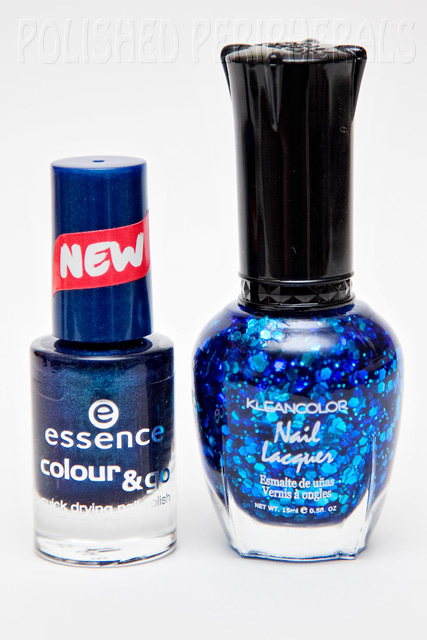 Essence Hard to Resist is part of the Essence Colour & Go polish line available from Target in Australia. No such luck with Kleancolor, I had to order my Blue-eyed Girl from the US. I thought I'd share a photo of my naked nails. This is immediately after polish removal and before any hand cream, cuticle cream and buffing. This is as bad as it gets. I use a home made polish remover, a mix of acetone, water and glycerol. It works really well and doesn't leave my nails as dry as the commercial (acetone free) stuff I used to use. The last commercial stuff I used actually made my skin peel but I'm prone to skin allergies so it could have been a reaction to the colour or perfume additives. Safer to stick with my own mix now. I had intended to do an 'after' photo, after a bit of hand and nail care and a good buffing but I forgot so for now I'm just sharing a before shot. 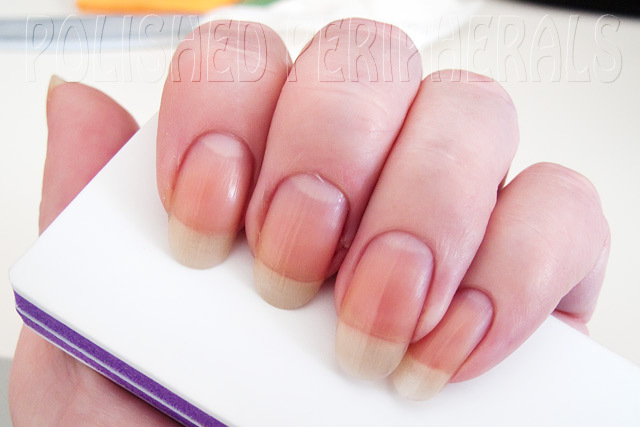 I actually like my naked nails and this is the shape they grow in naturally. I tried square nail tips for a while but it didn't suit me so now I leave my nails like this. I don't need to shape them and only get the file out if I get a break or they get too long. My cuticles are usually pretty good. I don't use any remover or cut them but I do push them back after a shower (something my Dad taught me to do as a kid). I have a shocking habit of picking at the skin on the sides of my fingers. It's a bit of a nervous habit (my Mom and kids do it too) and it only takes a cut or an allergy blister and I'll keep messing at it and peeling the skin off as it heals. Painting my nails helps fight the habit. It makes me more aware of how my fingers look. In this photo you can just see a bit of peeling on the side my middle finger. I cut it on my sons x-ray, like a super sized paper cut and it reached all the way up to the side of my nail. It's been 2 weeks and I'm having a hard time leaving it alone, acetone does not help! 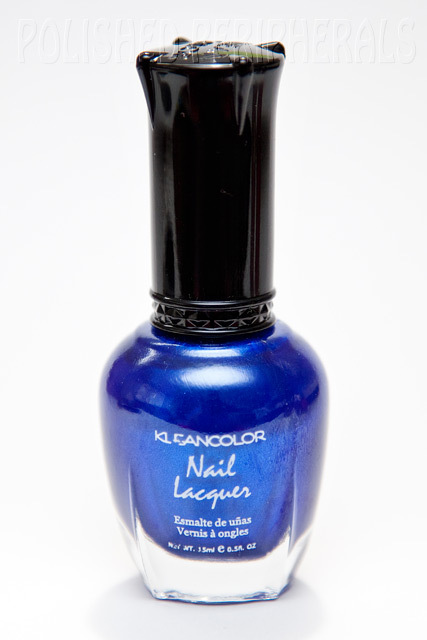 Kleancolor Cobalt is a nice bright blue that's opaque in just one coat. It goes on like a dream but seems to take a bit longer than average to dry. I've found that with all the Kleancolors I've tried though. It's not quite as vibrant or as opaque as the Kleancolor metallics I have but it's pretty close. Can you believe this is just one coat with not top coat! I always wear a top coat but have plans to layer something else on this so no top coat yet. Such a beautiful blue. We can't get Kleancolor locally so I had to order this from the US. Unfortunately that means the benefits of this being a cheap polish are countered by the cost of shipping but that's always a good excuse to order a few bottles to combine shipping :) I couldn't resist grabbing a range of Kleancolors to try, including some metallics I'll use for stamping. Here's a little something I wore in the lead up to Christmas. 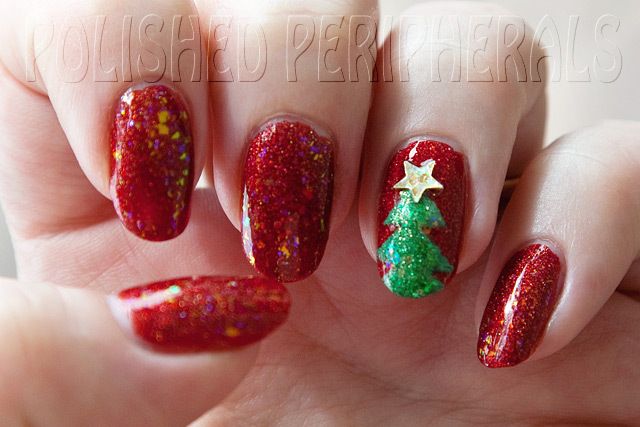 After 3 days of sparkly red nails I added a Christmas tree and some flakes. 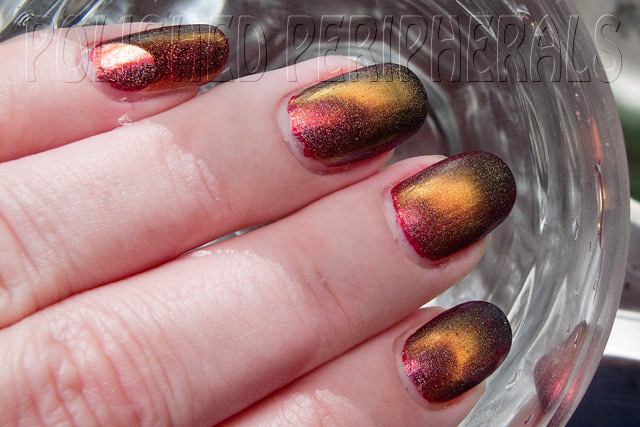 The gorgeous red is Ozotic 621, an amazingly rich holographic polish. It's stunning indoors and blinding in the sunlight. For the tree I used piCture pOlish Jealousy, a beautiful glittery green. Green is my favourite colour and I'm looking forward to using Jealousy for a full manicure. Then I layered 1 coat of piCture pOlish Festival over all my nails for a subtle flakie finish. 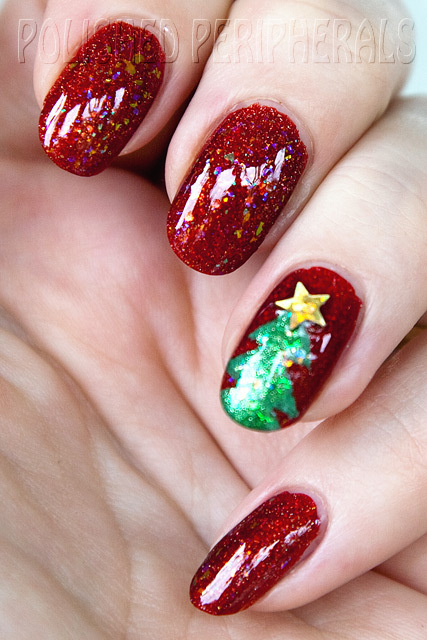 The flakie colours show up best over a dark colour or black but for this Christmas manicure it was just enough extra colour over red. The star is a chunky piece of glitter table decoration scatter (birthday themed). Not really the best for nails but all I had. I covered everything with a thick coat of Sally Hansen Mega Shine and it lasted another 5 days before I changed my nails for Christmas day. The Mega Shine I used is over 10 years old and only just starting to get a bit thick now. I have 2 bottles that old and one new one and they all perform beautifully as a shiny quick dry top coat, without shrinkage. So why do I have 3 bottles of Sally Hansen Mega Shine? Well I liked the first bottle so much I bought a second so I wouldn't run out (as you do). Then when I started painting my nails again last year, after 7 plus years of naked nails (showing my age now), I bought a new bottle thinking the old ones wouldn't be any good, but they were, so now I have 3. 2 old with old style black caps, 1 new with the blue cap. 1 of the old ones and the new are the same consistency so I use which ever is closest. The other old one that's getting thick is the one I use over glitter.